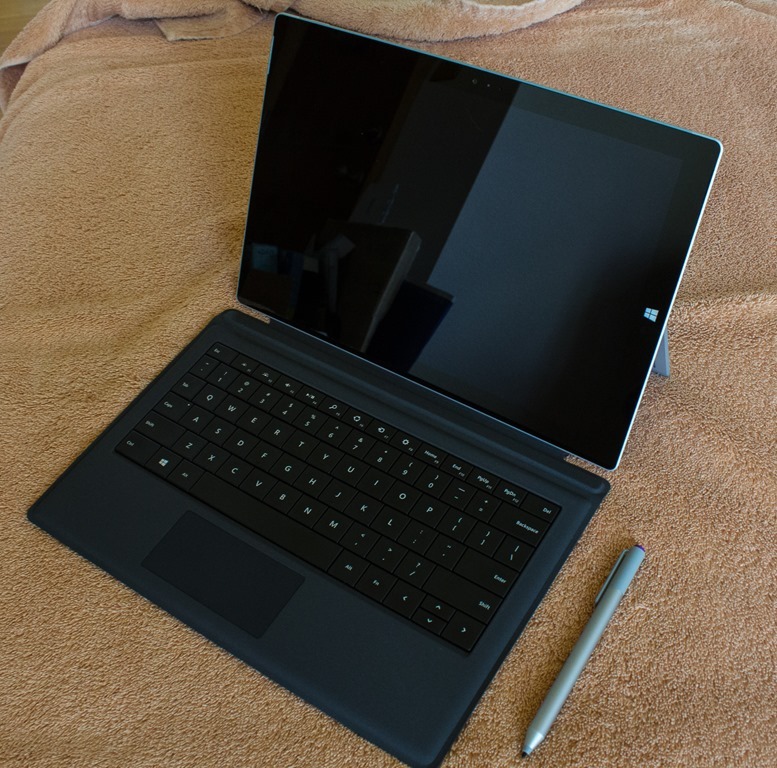 In February, I decided to buy and try out a Surface Pro 3. I’d read reviews such as Hanselman’s where he recounted using one for a couple of months and liking it, and it seemed to me that it was possibly a good replacement to my nearly two-year-old Dell XPS 12. The one primary reason for upgrading was DevExpress’ release of their grid for Xamarin.Forms: I’d bought a MacBook Air 11 for demoing that on travels, and I needed a lighter ultrabook to demo everything else we do. (And before someone pipes up and says, buy a MacBook Pro, been there, done that, moved on. Also I need a touch screen, so there.) The Air is 2.2 lbs, the XPS 12 is 3.3 lbs, so a chunky 5.5 lbs to lug around at conferences and to the booth. Meh, to put it bluntly. The Surface Pro 3 with Type Cover, on the other hand, was 2.44 lbs: OK that’s more like it. 1. It’s thin and light. 2. It’s fast enough for my purposes. 3. The continuous kickstand is way, way, way better than the original one- or two-position versions. I cannot emphasize how much better it is. 4. The pen is magic, although I don’t really use OneNote (clicking the pen will start up OneNote automatically). 5. It runs everything I want it to run. Office, Visual Studio, videos, games, what have you. Works just fine in that respect. 6. Battery life, that I saw, was fine. Mind you, I tend to use it plugged in. 1. The trackpad. Mind you, I dislike trackpads anyway and use an external Arc mouse all the time. 3a. One USB port. That’s high up on the right side. Since I use an external drive (backups and VMs) plus an external mouse, it means I have to have a hub. The whole thing then becomes unwieldy with this cable coming out of the machine about 6 inches in the air. Yes, I could buy/use a docking station, but I’m not going to be carrying that around with me when I travel. 3b. The power attachment is also on the right hand side. Another cable coming out in mid-air. (The mini DisplayPort is also on the right hand side and I’ll admit to never having used it, but it would be another cable coming out in mid air.) For “normal” laptops, the cables lie flush with the desk because they’re inserted into the main body and not the screen, so don’t seem to annoy me as much. 4. It’s not a laptop. By this I mean that I’m working at my desk, I need something behind the machine, and I naturally half close the screen to get at it. Except it’s not a laptop and the machine just slams shut onto the keyboard. Ditto, using it anywhere but on a flat surface. Others report it’s fine in those scenarios; me, not so much. 5. Weirdly, I don’t like the aspect ratio. I’m now used to widescreen (so, 16:9), and the Surface is not (that is, it’s 4:3). I'm setting up a Surface Pro 3 for our Build trip and what a PITA. It doesn't have a keyboard attachment or pen so that may contribute to the annoyance. But the biggest thing was battery life. It lasts, if you're lucky, 3-4 hours. For that, I'd rather have a MacBook Air with lots of memory, HD space, and Parallels. Otherwise, the new XPS you got looks very interesting too. Look forward to seeing it next week.